The launch of the Global compact for safe, orderly and regular migration in December 2018 marked the first-ever United Nations global agreement on a common approach to international migration in all its dimensions. The global compact aims to reduce the risks and vulnerabilities migrants face at different stages of migration, by respecting, protecting and fulfilling their human rights and providing them with care and assistance. The compact underscores migrants’ right to health and delineates the policies and process through which states might make this a reality. The compact in turn reflects the central aim of the United Nations 2030 Agenda for Sustainable Development to “leave no one behind”. Meeting many targets of the 17 Sustainable Development Goals will positively impact the health of migrants, but Target 3.8 is perhaps the most direct: “Achieve universal health coverage, including financial risk protection, access to quality essential health-care services and access to safe, effective, quality and affordable essential medicines and vaccines for all”. The Greater Mekong Subregion (GMS) has experienced consistent economic development over the last decade, and thus is a key example of the intersection of the right to health and migration. Multilateral agreements, such as the Association of Southeast Asian Nations (ASEAN) Trade Agreements or the GMS Economic Cooperation Program, have contributed to improved economic collaboration among GMS countries – Cambodia, Lao People’s Democratic Republic, Myanmar, the People’s Republic of China (Yunnan Province and Guangxi Zhuang Autonomous Region), Thailand and Viet Nam – through improvements in infrastructure and promotion of trade and investment. This development has brought a marked overall increase in human mobility within the region, which varies among the countries. Thailand is by far the main receiving country in the region, hosting between three and four million migrants from other GMS countries. Economic growth in the region has been promoted by the development of a transport network linking economic hubs creating active trade and labour markets in cities along economic corridors that integrate the regional economy., As a result, cross-border mobility in the GMS is highly dynamic and complex, with migration fluctuating on a daily or weekly basis in the border towns of the economic corridors. Either seasonal or long-term, labour migration constitutes the main type of migration in the GMS. Irregular migration (movement that takes place outside the regulatory norms of the sending, transit and receiving countries) remains widely spread throughout the region, and is the reason why it is difficult to obtain reliable migration data for the GMS. Recent estimates report over 5 million international migrants within the region, including 4.9 million in Thailand (of which 3.9 million are migrant workers from Cambodia, Lao People’s Democratic Republic, Myanmar and Viet Nam). Thus, for the aim of achieving elimination of malaria, human mobility and antimalarial multidrug resistance, including artemisinin resistance, remain issues of key concern in the GMS. The World Health Organization (WHO) Global technical strategy for malaria 2016–2030 and the Strategy for malaria elimination in the Greater Mekong Subregion have recognized the need for targeting migrants and mobile populations to achieve this goal. Both documents advocate providing migrants with access to health services, including access to protection measures, early diagnosis and treatment. The WHO Emergency response to artemisinin resistance in the Greater Mekong subregion: regional framework for action 2013–2015, launched in 2013 to contain the spread of the resistance, advocates expanding the provision of health services to include migrants. In 2008, the World Health Assembly recognized the need to address the health of migrants in its Resolution 61.17, which calls governments to take action on promoting equal access to health care for migrants and include them in national and regional health strategies. In 2017, the World Health Assembly ratified a further Resolution 70.15, on promoting the health of refugees and migrants and reaffirming the health-related commitments for refugees and migrants in the development of the Global compact on refugees and the Global compact for safe, orderly and regular migration. 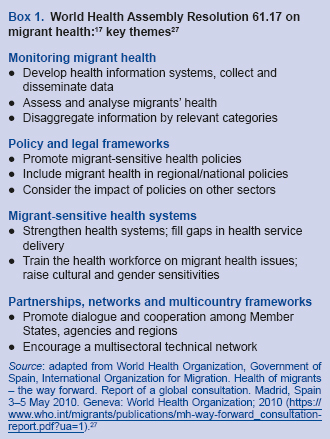 One of the four key themes of the Operational Framework on Migrant Health developed at the first Global Consultation on Migrant Health, and based on the World Health Assembly Resolution 61.17, is to assess and address policy and legal frameworks related to migrant health (see [Box 1]). Specifically, this involves adopting relevant international standards on the protection of migrants and respect for rights to health in national law and practice; implementing national health policies that promote equal access to health services for migrants; and extending social protections in health and improving social security for all migrants. In order to provide an evidence base and guidance for malaria programme managers at national level in addressing the policy and legal framework elements of migrants’ access to malaria services, the International Organization for Migration (IOM) and WHO partnered to collaborate on a review of policies and legal frameworks in five GMS countries (Cambodia, Lao People’s Democratic Republic, Myanmar, Thailand and Viet Nam), to provide recommendations for malaria programme managers on the technical implementation and policy implications of addressing malaria. The objective was to contribute to understanding and addressing the legal obstacles that migrants face in accessing health services and the impact that these obstacles have for elimination of malaria and containment of artemisinin resistance in the region. This paper describes key results and findings from the review and highlights the collaborative process that was undertaken to conduct the review and subsequent report publication. The review was undertaken, and the subsequent report produced, through a collaboration between IOM country offices, IOM’s Regional Office for Asia and the Pacific and the WHO Country Office for Thailand (Emergency Response to Artemisinin Resistance [ERAR]-GMS). The review was undertaken in 2015, with subsequent analysis, review and checking with respective ministry of health counterparts before being completed in 2016, and published by WHO in 2017. It is important to note that, as the data collection and review were undertaken in 2015, the review describes the laws and policies in place at that time. The methods used included (i) reviews of existing documentation, electronic databases and publications, detailing how Cambodia, Lao People’s Democratic Republic, Myanmar, Thailand and Viet Nam have addressed the health of inbound, outbound and internal migrants and responded to the global and regional migration and/or health frameworks, such as ASEAN resolutions, memoranda of understanding and other agreements; and (ii) supplementary informal discussions with key actors, such as the International Relations Division of the Ministry of Health and other ministries of Myanmar and Cambodia, and the Ministry of Health and Ministry of Foreign Affairs of Lao People’s Democratic Republic, as well as other experts in the field of malaria in Thailand. Each country review was conducted by in-country consultants or IOM country offices and further reviewed by the IOM Regional Office for Asia and the Pacific. A regional consultant was responsible for gathering applicable regional data and integrating all country reports. Technical review of the report was conducted by the Migration Health Unit of the IOM Regional Office for Asia and the Pacific, with inputs from the WHO ERAR focal person for malaria and border health, based at the WHO Country Office for Thailand. The review process also considered a range of international and regional instruments and their application in the context of malaria elimination and artemisinin resistance; these instruments covered areas including universal health coverage, conventions on occupational health and safety, the International Health Regulations (2005), World Health Assembly resolutions, and health and human rights. Furthermore, the review identified gaps and opportunities affecting the implementation of health policies and laws. By use of available data, reports, studies and publications to identify the trends in migration within and between countries, the review considered their implications not only for malaria but also for advancement of the right to health for all in the GMS. Selected illustrative findings are presented next. According to the International Labour Organization (ILO) Conventions (No. 97, 143 and 155),,, countries hosting migrant workers should have labour and social laws that protect their rights, especially concerning working conditions and occupational health and safety. Also, migrant workers should be provided with access to health services, including access to emergency care. Both medical care and safety and health protection should be equal to that provided to nationals. Thailand’s Workmen’s Compensation Act establishes rights for workers to access medical treatment in the event of work-related injury or illness; the associated medical expenses must be covered by employers, who are also obliged to compensate workers for lost income. Employers can use the Workmen’s Compensation Fund (to which they have the duty to pay contributions) to cover all these costs. However, although migrant workers have the same rights as Thai nationals, this Act only applies to workplaces with 10 or more employees. Cambodia and Lao People’s Democratic Republic also afford documented migrants’ protection under their labour laws. In Cambodia, the Labour Law, which covers all workers regardless of their nationality, except domestic or household servants, states that employers “must provide the primary healthcare for their workers” (art. 238). Occupational illnesses and work-related accidents must also be covered by employers, who should provide their workers with medical assistance, including medical treatment and hospitalization, and compensation if temporary incapacitation or permanent disability occurs. Additionally, employers are required to cover expenses related to chemical prophylaxis or vaccination against epidemics. In Lao People’s Democratic Republic, the Labour Law, which applies to all employees, including foreigners, includes a specific section on migrant labour that grants legal protection to foreign workers according to the laws of the Lao People’s Democratic Republic (art. 69). In the case of occupational diseases and/or work-related accidents, employers must take responsibility for treatment and rehabilitation costs. Viet Nam and Myanmar have few labour regulations ensuring health rights for migrant workers. Viet Nam has minimum health and safety regulations contained in the Law on Vietnamese Guest Workers and in Decree No. 44/2013/ND-CP. The Decree states the responsibility for participation in compulsory medical, social and unemployment insurance of employers and employees with labour contracts. The regulation also provides for minimum responsibilities of employers in the event of employees suffering occupational accidents or illnesses. These obligations consist of payment of first-aid expenses, full salary for the duration of treatment and compensation. Myanmar’s labour laws are over 60 years old and are limited in scope, not providing health rights for migrant workers. The Department of Labour is currently leading an internal process of drafting laws in this area. However, as the main sending country in the GMS, protection to Myanmar citizens working abroad has been provided for in the Law of Overseas Employment, which aims to ensure that overseas workers have access to medical treatment free of charge in cases of work-related injury or illness. Based on the principles of universal health coverage – ensuring that all people obtain the health services of adequate quality that they need without risk of financial ruin or impoverishment – and as stated in World Health Assembly Resolution 61.17, migrants, independently of their legal status, should be included in national health schemes. Cambodia, Lao People’s Democratic Republic, Myanmar and Viet Nam lag far behind Thailand regarding universal health coverage. When analysing how far GMS countries have gone towards achieving universal health coverage, and thus including migrants in their health systems, it was found that Thailand is the only GMS country that has established a universal health-care scheme. The scheme was introduced in 2002 after promulgation of the National Health Security Act that sets the legal basis for the country’s Universal Coverage Scheme. Data from 2008 estimated that the scheme covers 75% of Thai citizens. The remaining Thai population is covered by the Social Security Scheme, covering private sector workers (7%), or by the Civil Servant Medical Benefit Scheme, covering civil servants (16%). In 2001, in order to provide health coverage to documented migrant workers, Thailand established a Migrant Health Insurance Scheme that includes services for prevention, diagnosis and treatment. Payment of fees for annual membership for a compulsory annual medical examination is required to benefit from the scheme (1600 baht and 500 baht, respectively, in 2018). This scheme allows undocumented migrants to purchase health insurance membership. With this system, Thailand is a pioneer in providing access to health services for migrants; however, the access is restricted to the health facility where migrants were first registered. Regular migrant workers employed in the formal sector are able to join the Social Security Scheme with the same entitlements as Thai citizens, where employers and workers each contribute 5% of the worker’s salary, and the government contributes an amount equivalent to 2.75%. As of November 2018, it was reported that in Thailand approximately 64% of documented migrant workers from GMS countries who were eligible for health insurance coverage were enrolled. This proportion falls to 51% if all eligible migrants (documented and undocumented) are considered. In Cambodia, health-care services are mainly provided by the private sector., With the aim of increasing the use of public health services and promoting better access for the poor, health equity funds have been implemented across the country since 2000. These funds are run by a third party, normally a local nongovernmental organization, which operates with selected public health facilities. The government also has its own subsidy scheme, which is used to reimburse public health facilities for exempted user fees. A social security system for private sector workers is outlined in the Law on Social Security Schemes for persons defined by the provisions of the Labour Law. With compulsory contributions from employers, the National Security Fund ensures that employees can benefit from a pension scheme, health insurance scheme and employment injury insurance. The Law applies to all workers regardless of nationality. The draft of a Social Health Insurance Master Plan, based on the Strategic Framework for Health Financing 2008–2015, aims to further develop and expand universal coverage of social services – aimed at Cambodian nationals only – and group the existing schemes under a national social health protection system. Although efforts have been made to improve access to health services for poor and disadvantaged groups (National Social Protection Strategy for the Poor and Vulnerable), migrants are not included under this strategy. Lao People’s Democratic Republic currently has four social protection schemes moving towards achievement of universal health coverage: a mandatory Civil Servants’ Scheme, a Social Security Office Scheme, a voluntary community-based health insurance and a Health Equity Fund (fund for the poor). However, as of 2012, only 18% of the Lao population was covered by these schemes. Workers and their dependents are provided with health coverage under the social security office scheme; however, no specific mention is made of migrant workers. Given the provisions of the Labour Law, which suggest that documented migrant workers are afforded protection and access to health care, it could be inferred that documented migrant workers are entitled to health services under the Social Security Office Scheme. Lao People’s Democratic Republic lacks health-care laws in which migrants have been specifically considered; the country’s Law on Health Care 2014) states that all citizens are entitled to receive health care when ill; however, no reference is made to migrants. In Myanmar and Viet Nam, commitment has been made to attain universal health coverage by 2030., Myanmar’s National Health Plan 2011–2016 recognizes the importance of migration with respect to communicable diseases and health status in border areas. While migrants have been mentioned in initial planning meetings, there are no formal legislative or legal policy frameworks to ensure the inclusion of migrants in activities related to universal health coverage. In 2008, the Government of Viet Nam promulgated the Law on Health Insurance, to expand its national Social Health Insurance programme, and thus facilitate access to health services to, eventually, the entire population. Under this Law, migrant workers can participate in the national health insurance. However, access to health services for migrants is restricted by the Law on Residence, which links household registration status with the right to health and social services. Migrants typically possess temporary registration status and, under this type of registration, they cannot access certain health and social services, or they can access them only where they are permanently registered. Two main malaria frameworks are in place regarding malaria control in the GMS: the Strategy for malaria elimination in the Greater Mekong Subregion: 2015–2030 and the Emergency response to artemisinin resistance in the Greater Mekong subregion: regional framework for action 2013–2015. Both frameworks emphasize that provision of services for mobile and migrant populations is essential. The frameworks were supported by a series of practical guides, from the Mekong Malaria Elimination programme, on assisting countries to identify priorities surrounding population mobility and take action to develop proactive initiatives to respond to emerging population mobility and malaria trends in the region. The five GMS countries reviewed have adopted national strategies for malaria elimination in line with the frameworks; all of them recognize migrants as a vulnerable group. Notably, Cambodia has the best initiative to target migrants in the context of malaria elimination. In addition to its National Strategic Plan for Elimination of Malaria, it has designed the Strategy to Address Migrant and Mobile Populations for Malaria Elimination in Cambodia (2013). The document analyses migrants’ malaria vulnerability and describes the associated risks according to movement patterns and work type. Relevant proposed interventions targeting migrants are described, including implementation of prevention measures such as health education through mass media, videos in buses and taxis, or information, education and communication materials; distribution of long-lasting insecticidal nets; early diagnosis and treatment; and increased surveillance and research to track malaria and migration hotspots. In their national malaria strategies, both Myanmar and Thailand mention the need to provide clinical services for malaria for migrants. In Myanmar, migrants are recognized in the National Strategic Plan for Malaria Prevention and Control 2010–2016 as a vulnerable group, and are explicitly referenced in its section on “Directions for malaria prevention”. The plan includes action points targeting migrants, such as establishing malaria clinics in strategic and hard-to-reach areas with large numbers of migrant workers, and providing specific information, education and communication materials for migrants. In its national strategy, Thailand has also acknowledged migrants as a target population for malaria control. The strategy calls for specific programmes to control malaria in migrants and considers this a key group for containment of the spread of artemisinin-resistant malaria parasites. Decreasing the annual parasite incidence in migrants is one of the targets of the strategy. To that end, cross-border screening and treatment of migrant workers should be provided. The Lao National Strategy for Malaria Control and Pre-elimination 2011–2015 also recognizes migrants, especially temporary and seasonal workers, as a key risk group for malaria. Development of specific information, education and communication, such as roadside bill-boards targeting migrant workers, and mass media campaigns is mentioned in the objectives of the strategy. Viet Nam’s national strategy for malaria control suggests increasing research activities on vector-control measures for migrant workers but does not specifically recognize migrants as a vulnerable group. Nevertheless, Viet Nam’s Action Plan to Prevent Artemisinin Resistance Malaria for the period of 2015–2017 targets seasonal workers, specifically cashew and cassava farm labourers, as a risk group. The plan provides for ensuring rapid diagnosis and malaria treatment for migrants. At the time the review was undertaken, all GMS countries are committed to, among others, the WHO Global technical strategy for malaria 2016–2030, and the WHO Strategy for malaria elimination in the Greater Mekong Subregion (2015–2030), launched in May 2015. In May 2007, the countries signed memoranda of understanding to continue indefinitely with the Mekong Basin Disease Surveillance project, through which the countries have been working together since 2001 to progressively build local capacity, share information and cooperate in outbreak response and pandemic preparedness. All are signatories to the ASEAN Declaration on Strengthening Social Protection. All have also entered into bilateral agreements with one another regarding migration or trafficking in persons, which include cooperation on health matters, such as focal points for health services at border crossings; health-care assistance; health insurance; occupational health and safety; and even a trilateral cooperation for health between Myanmar, Thailand and the United States Cross-Border Partnership, which provides a platform for cities along the border to synchronize malaria-control activities. As of 2015, all GMS countries have adopted national strategies for the elimination of malaria, in line with the WHO Global technical strategy for malaria 2016–2030 and the World Health Assembly Resolution WHA68.2 for 2016–2030, which specifically recognize migrants and mobile populations as a vulnerable group. In 2017, WHO published A framework for malaria elimination, providing malaria-endemic countries with further guidance for national strategic plans for malaria elimination, specifically on the tools, activities and dynamic strategies required to achieve interruption of transmission and to prevent re-establishment of malaria. In November 2017, recognizing the need for high-level political commitment, the minsters of health of all Member States in the WHO South-East Asia Region made a commitment towards a malaria-free region by 2030, through signing the Ministerial declaration on accelerating and sustaining malaria elimination in the South-East Asia Region, with a Regional Action Plan 2017–2030, along with a framework for a South-Asia subregional cross-border collaboration network to eliminate malaria. A Ministerial call for action to eliminate malaria in the Greater Mekong Subregion before 2030 was also adopted by GMS countries at a high-level meeting in December 2017. Although migrant workers are specifically mentioned in some of the policy documents and legal frameworks reviewed, it remains unclear whether the term “migrant” refers to international or internal migrants or both. Inconsistent use of the term has been observed across the GMS countries, together with a lack of specific health legislation directly addressing inbound migrants. This lack of specificity leaves much room for subjective interpretation, which may result in inconsistent legal protection for migrants in the region. The use of the term “migrant and mobile populations” appears to have been interpreted in national malaria strategies as exclusively including internal migrants or citizens, but specific reference to inbound migrants is not made. Findings show that all GMS countries except Myanmar have minimum occupational health and safety regulations. However, malaria has not been specifically considered as an occupational health concern in any of the existing regulations, even though, owing to the nature of the work, some workers such as those involved in agricultural or forest activities, are considerably exposed to the parasite. It could be argued that malaria should fall under these regulations in cases where there is a foreseeable risk of contracting malaria in a work setting. Provision of malaria prophylaxis and treatment medications for at-risk workers could be included in occupational health and safety policies in the same way that the Cambodia Labour Law requires employers to cover expenses related to chemical prophylaxis or vaccination against epidemics. Also, other protective measures for malaria, such as insecticide treatment kits, long-lasting insecticidal nets, or personal protective equipment could be then provided and covered by employers if stipulated by labour laws. Although efforts are being made towards achieving universal health coverage in the GMS countries, migrants are not included in health financing schemes, apart from in Thailand, and existing laws and policy documents do not refer to migrants in their roadmaps towards universal health coverage. Current regulations for health and social protection do not ensure migrants’ access to health services, except in Thailand, where documented and undocumented migrants can opt for acquiring health insurance. Additionally, there is a lack of migrant-inclusive legislation in GMS countries, since barriers to accessing health services for migrants – such as language and/or socioeconomic factors – have been scarcely considered. Advocacy to promote legislative approaches that include migrants’ health needs have been made at global and regional levels, to overcome these barriers. Although migrants have been mentioned and frequently identified as a vulnerable group in national strategies for malaria in the GMS, not all the strategies address migrants similarly. While interventions such as information, education and communication campaigns and early diagnosis and treatment for migrants have been acknowledged in all strategies, malaria surveillance and mapping of migrants have not always been considered. The report based on this review provides detailed short- and long-term recommendations for internal, inbound and outbound migrants. While there is now uniform recognition of the need to include migrants and mobile populations in elimination and control of malaria in GMS countries, there remain discrepancies in the adoption and implementation of legal and policy frameworks that promote migrants’ and mobile populations’ access to health and malaria services in the GMS. All GMS countries have adopted national malaria strategies in line with the current WHO Global technical strategy for malaria 2016–2030, and the WHO publication A framework for malaria elimination; however, there remain multiple legal and policy-level barriers for migrants in accessing health and malaria services across the GMS. In line with current efforts at global, regional and national levels to improve the health of migrants, including via the Global compact for safe, orderly and regular migration, the WHO Global action plan to promote the health of refugees and migrants and refugees, drafted in preparation for the 72nd World Health Assembly in 2019, and other relevant initiatives, IOM and WHO stand ready to continue to collaborate and assist Member States in reviewing and adopting migrant-friendly policies and legal frameworks that promote rather than hinder migrants’ and mobile populations’ access to health services. This successful collaboration between IOM, WHO and Member States to review international, regional and national policies and legal frameworks for GMS countries can serve as an example and template for other countries and for other programmes where the health of migrants is critical to achieving national, regional and global health goals. Acknowledgements: We thank the technical experts from the IOM, WHO and the relevant ministries of health within GMS whose collaborative efforts made the work discussed in this paper possible. Authorship: All authors contributed equally to this paper. Global Compact for Migration. Global compact for safe, orderly and regular migration. Intergovernmentally negotiated and agreed outcome. 13 July 2018 (https://refugeesmigrants.un.org/sites/default/files/180713_agreed_outcome_global_compact_for_migration.pdf, accessed 21 January 2019). Migration health in the Sustainable Development Goals: ‘leave no one behind’ in an increasingly mobile society. Geneva: International Organization for Migration, The UN Migration Agency; 2017 (https://www.iom.int/sites/default/files/our_work/ICP/MProcesses/Migration-and-Health-in-SDGs-MHD-factsheet.pdf, accessed 21 January 2019). Global indicator framework for the Sustainable Development Goals and targets of the 2030 Agenda for Sustainable Development. New York: United Nations; 2018 (A/RES/71/313; E/CN.3/2018/2; https://unstats.un.org/sdgs/indicators/Global%20Indicator%20Framework%20after%20refinement_Eng.pdf, accessed 21 January 2019). Greater Mekong Subregion Economic Cooperation Program. Manila: Asian Development Bank; 2015 (https://www.adb.org/sites/default/files/publication/29387/gms-ecp-overview-2015.pdf, accessed 22 January 2019). Huelser S, Heal A. Moving freely? Labour mobility in ASEAN. Asia Pacific Research and Training Network on Trade. Policy Brief No. 40. Bangkok: ARTNet; 2014 (https://www.unescap.org/sites/default/files/polbrief40.pdf, accessed 21 January 2019). Health of migrants. Report by the Secretariat. In: Sixty-first World Health Assembly, Geneva, 19–24 May 2008. Provisional agenda item 11.9. Geneva: World Health Organization; 2008 (A61/12; http://apps.who.int/iris/bitstream/handle/10665/23467/A61_12-en.pdf?sequence=1, accessed 21 January 2019). Harkins B, ed. Thailand migration report 2019. Bangkok: United Nations Thematic Working Group on Migration in Thailand; 2019 (https://thailand.iom.int/sites/default/files/document/publications/Thailand%20Report%202019_22012019_HiRes.pdf, accessed 4 March 2019). President’s Malaria Initiative. Greater Mekong Subregion. Malaria Operational Plan FY2014. Washington (DC): United States Agency for International Development; 2014 (https://www.pmi.gov/docs/default-source/default-document-library/malaria-operational-plans/fy14/mekong_mop_fy14.pdf?sfvrsn=16, accessed 5 March 2019). 9. Global technical strategy for malaria 2016–2030. Geneva: World Health Organization; 2015 (http://apps.who.int/iris/bitstream/handle/10665/176712/9789241564991_eng.pdf?sequence=1, accessed 21 January 2019). Edwards HM, Canavati SE, Rang C, Ly P, Sovannaroth S, Canier L et al. Novel cross-border approaches to optimise identification of asymptomatic and artemisinin-resistant plasmodium infection in mobile populations crossing Cambodian borders. PLoS One. 2015;10(9):e0124300. doi:10.1371/journal.pone.0124300. Jitthai N. Migration and malaria. Southeast Asian J Trop Med Public Health. 2013;44 Suppl. 1:166–200. Strategy for malaria elimination in the Greater Mekong Subregion: 2015–2030. Geneva: World Health Organization; 2015 (http://iris.wpro.who.int/bitstream/handle/10665.1/10945/9789290617181_eng.pdf, accessed 21 January 2019). Tatem A, Smith D. International population movements and regional Plasmodium falciparum malaria strategies. Proc Natl Acad Sci U S A. 2011;107(27):12222–7. doi:10.1073/pnas.1002971107. Delacollette C, D’Souza C, Christophel E, Thimasarn K, Abdur R, Bell D et al. Malaria trends and challenges in the Greater Mekong Subregion. Southeast Asian J Trop Med Public Health. 2009;40(4):674–91. Approaches for mobile and migrant populations in the context of malaria multi-drug resistance and malaria elimination in the Greater Mekong Subregion. New Delhi: World Health Organization Regional Office for South-East Asia; 2016 (http://apps.who.int/iris/bitstream/handle/10665/204351/Approaches_%20mobile_migrant_populations.pdf?sequence=2&isAllowed=y, accessed 21 January 2019). Action and investment to defeat malaria 2016–2030. For a malaria-free world. Geneva: World Health Organization on behalf of the Roll Back Malaria Partnership Secretariat; 2015 (https://www.mmv.org/sites/default/files/uploads/docs/publications/RBM_AIM_Report.pdf, accessed 21 January 2019). Resolution WHA61.17. Health of migrants. In: Sixty-first World Health Assembly, Geneva, 19–24 May 2008. Resolutions and decisions, annexes. Geneva: World Health Organization; 2008 (WHA61.17; http://apps.who.int/iris/bitstream/handle/10665/23533/A61_R17-en.pdf;jsessionid=088417CD75BF45AF46B1FEE27C5CAC4E? sequence=1, accessed 21 January 2019). Khamsiriwatchara A, Wangroongsarb P, Thwing J, Eliades J, Satimai W, Delacollette C et al. Respondent-driven sampling on the Thailand-Cambodia border. I. Can malaria cases be contained in mobile migrant workers? Malar J. 2011;10:120. doi:10.1186/1475-2875-10-120. World Health Organization. Universal health coverage (https://www.who.int/news-room/fact-sheets/detail/universal-health-coverage-(uhc), accessed 21 January 2019). World Malaria Report 2018. Geneva: World Health Organization; 2018 (https://apps.who.int/iris/bitstream/handle/10665/275867/9789241 565653-eng.pdf?ua=1, accessed 5 March 2019). Eliminating malaria in the Greater Mekong Subregion: united to end a deadly disease. Geneva: World Health Organization; 2016 (https://apps.who.int/iris/bitstream/handle/10665/251668/WHO-HTM-GMP-2016.12-eng.pdf?sequence=1, accessed 5 March 2019). Cui L, Cao Y, Kaewkungwal J, Khamsiriwatchara A, Lawpoolsri S, Soe TN et al. Malaria elimination in the Greater Mekong Subregion: challenges and prospects. In: Manguin S, Dev V, eds. Towards malaria elimination – a leap forward. London: IntechOpen; 2018 (http://dx.doi.org/10.5772/intechopen.76337, accessed 5 March 2019). Global Malaria Programme. Artemesinin resistance and artemisinin-based combination therapy efficacy. Status report. Geneva: World Health Organization; 2018 (http://apps.who.int/iris/bitstream/handle/10665/274362/WHO-CDS-GMP-2018.18-eng.pdf?ua=1, accessed 21 January 2019). Emergency response to artemisinin resistance in the Greater Mekong subregion: regional framework for action 2013–2015. Geneva: World Health Organization; 2013 (http://apps.who.int/iris/bitstream/10665/79940/1/9789241505321_eng.pdf, accessed 21 January 2019). Resolution WHA70.15. Promoting the health of refugees and migrants. In: Seventieth World Health Assembly, Geneva, 22–31 May 2017. Resolutions and decisions, annexes. Geneva: World Health Organization; 2017 (WHA70.15; http://www.who.int/migrants/about/A70_R15-en.pdf?ua=1, accessed 21 January 2019). Report of the United Nations High Commissioner for Refugees. Part II. Global compact on refugees. New York: United Nations; 2018 (A/73/12(Part II); https://www.unhcr.org/gcr/GCR_English.pdf, accessed 22 January 2019). World Health Organization, Government of Spain, International Organization for Migration. Health of migrants – the way forward. Report of a global consultation. Madrid, Spain 3–5 May 2010. Geneva: World Health Organization; 2010 (https://www.who.int/migrants/publications/mh-way-forward_consultation-report.pdf?ua=1, accessed 21 January 2019). World Health Organization, International Organization for Migration. Population mobility and malaria. New Delhi: World Health Organization, Regional Office for South-East Asia; 2017 (http://apps.who.int/iris/bitstream/handle/10665/255816/9789290225645-eng.pdf?sequence=1&isAllowed=y, accessed 21 January 2019). International Health Regulations (2005), 3rd ed. Geneva: World Health Organization; 2006 (http://apps.who.int/iris/bitstream/handle/10665/246107/9789241580496-eng.pdf?sequence=1, accessed 22 January 2019). International Labour Organization. C097 – Migration for Employment Convention (Revised), 1949 (No. 97) (https://www.ilo.org/dyn/normlex/en/f?p=NORMLEXPUB:12100:0::NO::P12100_INSTRUMENT_ID:312242, accessed 21 January 2019). International Labour Organization. C143 – Migrant Workers (Supplementary Provisions) Convention, 1975 (No. 143) (https://www.ilo.org/dyn/normlex/en/f?p=NORMLEXPUB:12100:0::NO::P12100_ILO_CODE:C143, accessed 21 January 2019). International Labour Organization. C155 – Occupational Safety and Health Convention, 1981 (No. 155) (https://www.ilo.org/dyn/normlex/en/f?p=normlexpub:12100:0::no::p12100_instrument_id:312300, accessed 21 January 2019). Workmen’s Compensation Act B.E. 2537 of 15 June 1994. Bangkok: Social Security Office, 1995–02, Technical Studies and Planning Division; 1994 (https://www.ilo.org/dyn/natlex/natlex4.detail?p_lang=en&p_isn=46852, accessed 21 January 2019). Chea S. Labour Law. Phnom Penh: National Assembly of the Kingdom of Cambodia; 1997 (http://www.metheavy.com/File/Media/CAMBODIA LABOURLAW.pdf, accessed 21 January 2019). Lao People’s Democratic Republic. Labor Law (Amended). Vientiane: National Assembly; 2013 (https://www.ilo.org/dyn/natlex/docs/MONOGRAPH/96369/113864/F1488869173/LAO96369 Eng.pdf, accessed 21 January 2019). Law on Vietnamese Guest Workers (No. 72/2006/QH11). Official Gazette – The English Translation of Công Báo. 2007-05;9–10:4–33 (https://www.ilo.org/dyn/natlex/natlex4.detail?p_lang=en&p_isn=91702&p_country=VNM&p_count=532&p_classification=17&p_classcount=40, accessed 21 January 2019). Decree No. 44/2013/ND-CP of May 10, 2013, detailing a number of articles of the Labour Code regarding labour contracts. Official Gazette –The English Translation of Công Báo. 2013-05;3–4:35–40 (https://www.ilo.org/dyn/natlex/natlex4.detail?p_lang=en&p_isn=94447, accessed 21 January 2019). The Law Relating to Overseas Employment (Law No. 3/99). Nay Pyi Taw: Office of the Attorney General Myanmar; 1999 (https://www.ilo.org/dyn/natlex/natlex4.detail?p_lang=en&p_isn=72869&p_country=MMR&p_count=86&p_classification=17&p_classcount=6, accessed 22 January 2019). Kantayaporn T, Mallik S. Migration and health service system in Thailand: situation, responses and challenges in a context of AEC in 2015. Geneva: World Health Organization; 2013 (http://apps.who.int/iris/bitstream/handle/10665/204591/Migrant-health-service.pdf?sequence=1&isAllowed=y, accessed 21 January 2019). Guinto RL, Curran UZ, Suphanchaimat R, Pocock NS. Universal health coverage in ‘One ASEAN’: are migrants included? Glob Health Action. 2015;8(25749):1–16. doi:10.3402/gha.v8.25749. Van Minh H, Pocock NS, Chaiyakunapruk N, Chhorvann C, Duc HA, Hanvoravongchai P et al. Progress toward universal health coverage in ASEAN. Glob Health Action. 2014;7(1):1–12. doi:10.3402/gha.v7.25856. Tangcharoensathien V, Patcharanarumol W, Prakongsai P, Panichkriangkrai W, Sommanustweechai A, Silva C et al. Embedding equity in universal health coverage schemes: lessons learned from Thailand. Bangkok: United Nations Development Programme Bangkok Regional Hub; 2016 (http://ihppthaigov.net/DB/publication/attachnewsletter/62/chapter1.pdf, accessed 21 January 2019). Wangroongsarb P, Satimai W, Khamsiriwatchara A, Thwing J, Eliades JM, Kaewkungwal J et al. Respondent-driven sampling on the Thailand-Cambodia border. II. Knowledge, perception, practice and treatment-seeking behaviour of migrants in malaria endemic zones. Malar J. 2011;10:117. doi:10.1186/1475-2875-10-117. Ly P, Thwing J, McGinn C, Quintero CE, Top-Samphor N, Habib N et al. The use of respondent-driven sampling to assess malaria knowledge, treatment-seeking behaviours and preventive practices among mobile and migrant populations in a setting of artemisinin resistance in Western Cambodia. Malar J. 2017;16(1):1–9. doi:10.1186/s12936-017-2003-9. Law on social security schemes for persons defined by the provisions of the Labour Law. Phnom Phen: Ministry of Social Affairs, Labour, Vocational Training and Youth Rehabilitation; 2002 (https://www.ilo.org/dyn/natlex/natlex4.detail?p_lang=en&p_isn=71910, accessed 21 January 2019). Annear PL. Cambodia: developing a strategy for social health protection. In: Promoting sustainable strategies to access to health care in the Asian and Pacific Region. Bangkok: United Nations Economic and Social Commission for Asia and the Pacific; 2009:1–36 (http://citeseerx.ist.psu.edu/viewdoc/download?doi=10.1.1.566.3851&rep=rep1&type=pdf, accessed 21 January 2019). National Social Protection Strategy for the Poor and Vulnerable. Phnom Penh: Royal Government of Cambodia; 2011 (https://www.unicef.org/cambodia/National_Social_Protection_Strategy_for_the_Poor_and_Vulnerable_Eng.pdf, accessed 22 January 2019). Law on Health Care (Amended) No. 58/NA. Vientiane: Ministry of Health; 2014 (http://www.laoservicesportal.gov.la/index.php?r=site%2Fdisplaylegal&id=203#mlist, accessed 4 March 2019). Han SM, Rahman MM, Rahman MS, Swe KT, Palmer M, Sakamoto H. Progress towards universal health coverage in Myanmar: a national and subnational assessment. Lancet Glob Health. 2018;6(9):e989–e997. doi:10.1016/S2214-109X(18)30318-8. World Health Organization Western Pacific Region. WHO calls for action to achieve health for all in Viet Nam. Media release, Ha Noi, 7 April 2018 (http://www.wpro.who.int/vietnam/mediacentre/releases/2018/WorldHealthDay2018/en/, accessed 21 January 2019). National Health Plan 2011–2016. Nay Pyi Taw: Ministry of Health, The Republic of the Union of Myanmar; 2016 (http://mohs.gov.mm/cat/NHP%20(2011-2016), accessed 21 January 2019). Health of refugees and migrants. Practices in addressing the health needs of refugees and migrants. New Delhi: World Health Organization Regional Office for South-East Asia; 2018 (https://www.who.int/migrants/publications/SEARO-Practices.pdf?ua=1, accessed 21 January 2019). Law on Health Insurance (No. 25/2008/QH12) as promulgated by Order No. 23/2008/L-CTN of November 28, 2008. Hanoi: National Assembly of the Socialist Republic of Viet Nam; 2008 (https://www.ilo.org/dyn/natlex/natlex4.detail?p_lang=en&p_isn=82231, accessed 4 March 2019). Do N, Oh J, Lee J. Moving toward universal coverage of health insurance in Vietnam: barriers, facilitating factors, and lessons from Korea. J Korean Med Sci. 2014;29(7):919–25. doi:10.3346/jkms.2014.29.7.919. Law on Residence. Hanoi: The National Assembly; 2006 (http://www.moj.gov.vn/vbpq/en/lists/vn%20bn%20php%20lut/view_detail.aspx?itemid=3710, accessed 22 January 2019). World Health Organization. Mekong Malaria Elimination (MME) programme. Technical and meeting reports (https://www.who.int/malaria/areas/greater_mekong/technical-reports/en/, accessed 21 January 2019). National Strategic Plan for Elimination of Malaria in Cambodia (2011–2025). Phnom Penh: Royal Government of Cambodia; 2011 (http://www.cnm.gov.kh/userfiles/file/N%20Strategy%20Plan/National%20Strtegyin%20English.pdf, accessed 22 January 2019). Canavati S, Chea N, Guyant P, Roca-Feltrer A, Yeung S. Strategy to Address Migrant and Mobile Populations for Malaria Elimination in Cambodia. MMP strategy – March 2013. London: Malaria Consortium; 2013 (https://www.malariaconsortium.org/media-downloads/255/Strategy%20to%20address%20migrant%20and%20mobile%20populations%20for%20malaria%20elimination%20in%20Cambodia, accessed 21 January 2019). National Strategic Plan Malaria Prevention and Control 2010–2016. Nay Pyi Yaw: Ministry of Health, The Republic of the Union of Myanmar; 2014 (https://pr-myanmar.org/sites/pr-myanmar.org/files/publication_docs/revised_nsp_2016_final_december_2014.pdf, accessed 21 January 2019). National Strategy for Malaria Control and Pre-elimination 2011–2015. Vientiane: Ministry of Health, Lao People’s Democratic Republic; 2010 (https://www.thecompassforsbc.org/sites/default/files/project_examples/Lao%20PDR%20NMSP%202011-2015.pdf, accessed 21 January 2019). National Strategy for Malaria Control and Elimination in the period 2011–2020 and orientation to 2030. Hanoi: Government, Socialist Republic of Viet Nam; 2011 (http://www.wpro.who.int/vietnam/topics/malaria/vnm_national_strategy_for_malaria_controlnelimination.pdf, accessed 5 March 2019). National Malaria Programme review – Viet Nam. Manila: World Health Organization Regional Office for the Western Pacific; 2018 (http://www.wpro.who.int/vietnam/national_malaria_programme_review_viet_nam_april_2018.pdf, accessed 5 March 2019). An urgent front: cross-border collaboration to secure a malaria-free South-East Asia Region. Development of an operational framework. New Delhi: World Health Organization Regional Office for South-East Asia; 2018 (http://apps.searo.who.int/PDS_DOCS/B5440.pdf, accessed 21 January 2019). ASEAN Declaration on Strengthening Social Protection. Jakarta: ASEAN Secretariat; 2018 (https://asean.org/storage/2019/01/26.-November-2018-ASEAN-Declaration-on-Strengthening-Social-Protection-1st-Reprint.pdf, accessed 18 March 2019). United States Agency for International Development. Trilateral cooperation for health (https://www.usaid.gov/asia-regional/fact-sheets/trilateral-cooperation-health, accessed 21 January 2019). Resolution WHA68.2. Global technical strategy and targets for malaria 2016–2030. In: Sixty-eighth World Health Assembly, Geneva, 18–26 May 2015. Resolutions and decisions. Geneva: World Health Organization; 2015:5–8 (WHA68/2015/REC/1; http://apps.who.int/gb/ebwha/pdf_files/WHA68-REC1/A68_R1_REC1-en.pdf#page=27, accessed 22 January 2019). Global Malaria Programme. A framework for malaria elimination. Geneva: World Health Organization; 2017 (http://apps.who.int/iris/bitstream/handle/10665/254761/9789241511988-eng.pdf;jsessionid=CE4CA636536FFB2809AA157C4741C7DE? sequence=1, accessed 21 January 2019). Ministerial declaration on accelerating and sustaining malaria elimination in the South-East Asia Region. New Delhi, 29 November 2017. New Delhi: World Health Organization Regional Office for South-East Asia; 2017 (http://www.searo.who.int/entity/malaria/sea_declaration_malaria_elimination.pdf?ua=1, accessed 21 January 2019). Regional Action Plan 2017–2030. Towards 0. Malaria-free South-East Asia Region. New Delhi: World Health Organization Regional Office for South-East Asia; 2017 (http://apps.who.int/iris/bitstream/handle/10665/272389/9789290226253-eng.pdf?ua=1, accessed 21 January 2019). Ministerial call for action to eliminate malaria in the Greater Mekong Subregion before 2030. Nay Pyi Taw, 8 December 2017. New Delhi: World Health Organization Regional Office for South-East Asia; 2018 (http://www.searo.who.int/entity/malaria/call4action_malaria_20171208_signed.pdf?ua=1, accessed 21 January 2019). Global action plan to promote the health of refugees and migrants. Draft 4+, 19 October 2018. Geneva: World Health Organization; 2018 (https://www.who.int/migrants/Global_Action_Plan_for_migration.pdf, accessed 21 January 2019).